Inertial navigation is accepted as an ideal navigation system because it meets all the criteria of an ideal system. INS provides worldwide ground plot information regardless of flightpath and aircraft performance. An INS can measure groundspeed independently of wind and independently of the operating environment. INS is completely independent of ground transmissions and passive in operation. It is selfcontained and portable; most units weigh less than 100 pounds. Some ring laser gyro systems weigh as little as 20 pounds. The need for a system with these properties has spurred development to the point where INS is superior to almost every other navigation system. INS provides accurate velocity information instantaneously for all maneuvers, as well as an accurate attitude and heading reference. INS accuracy decreases as the time between position updates increases. INS maintains its accuracy for short flights without position updates; however, longer flights may require periodic inflight updates. In the last several years, inertial technology has taken several leaps forward. Early inertials were bulky devices weighing several hundred pounds, whose installation had to be precise and whose operation had to be planned in great detail. Today, there are compact systems that fit in a briefcase and can be bolted to an aircraft in any space available. While some inertial systems still have mechanical gyroscopes, pendulous linear accelerometers, and space stable platforms, most have evolved to keep pace with the advances in technology. Acoustic gyros, ring laser gyros, and electronically suspended gyros have replaced the gimbaled gyroscope. Laser and acoustic accelerometers are replacing the pendulous linear accelerometer. Highly accurate computers and precision sensors have led to modifications of the space stable platform so the INS housing does not need to be accurately aligned with the aircraft. Eventually software will perform all the functions of the space stable platform. Despite all these modern advances, we can better learn about and understand inertial systems by studying the original systems. The basic principle behind inertial navigation is straightforward. Starting from a known point, you calculate your present position (a continuously running DR) from the direction and speed traveled since starting navigation. The difference between other navigation systems and INS is how it determines direction, distances, and velocities. Accelerations are detected by the three linear accelerometers. These accelerations are integrated over time to determine changes in velocity. Velocity is integrated a second time to determine distance traveled. Changes in vector direction are detected with angular accelerometers. As sensors detect changes in gyroscope orientation, correction signals are generated to reorient the stable platform to the original position and determine new vector direction. INS requires no other inputs. It avoids all environmental inputs, such as indicated or true airspeed, magnetic heading, drift, and winds that are necessary for dead reckoning. Three linear accelerometers arranged orthogonally to supply X, Y, and Z axis components of acceleration. Gyroscopes to measure and use changes in aircraft vector to maintain and orient the stable platform. A stable platform oriented to keep the X and Y axis linear accelerometers oriented north-south and eastwest to provide azimuth orientation and to keep the Z axis aligned with the local gravity vector. The stable platform is necessary to prevent either the X or Y axis accelerometer from picking up the force of gravity and interpreting it as an acceleration on the aircraft. Integrators to convert raw acceleration data into velocity and distance data. A computer to continuously calculate position information. Acceleration-measuring devices are the heart of all inertial systems. It is important that they function reliably for all maneuvers within the capability of the aircraft and that all possible sources of error are minimized. Very slight accelerations and changes in heading in all directions must be detected. Changes in temperature and pressure must not affect INS operation. To do this, INS requires two types of accelerometers: linear and angular. To obtain acceleration in all directions, three accelerometers are mounted mutually perpendicular in a fixed orientation. To convert acceleration into useful information, the acceleration signals must be integrated to produce velocity and then the velocity information is integrated to get the distance traveled. One of the forces measured by the linear accelerometers is gravity. This acceleration may be incorrectly interpreted as an acceleration of the aircraft if the stabilized platform is tilted relative to the local gravity vector. The accelerometers cannot distinguish between actual acceleration and the force of gravity. This means that the linear accelerometers on the stable platform must be kept level relative to the earth’s surface (perpendicular to the local gravity vector). The gyroscopes keep the stabilized platform and the accelerometers level and oriented in a north-south and east-west direction. 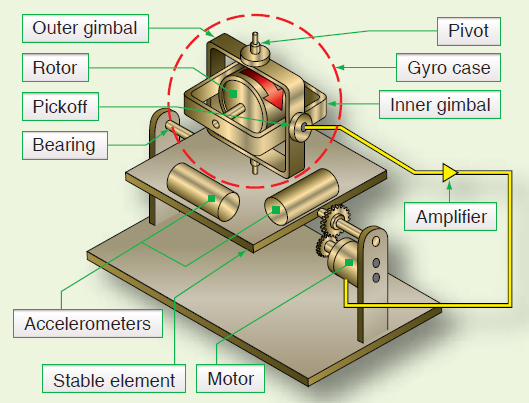 Gyroscopes are used in inertial systems to measure angular acceleration and changes in orientation and heading. While the types of gyros are briefly discussed here, the function of the gyro is discussed in great detail in the next section on the stable platform. 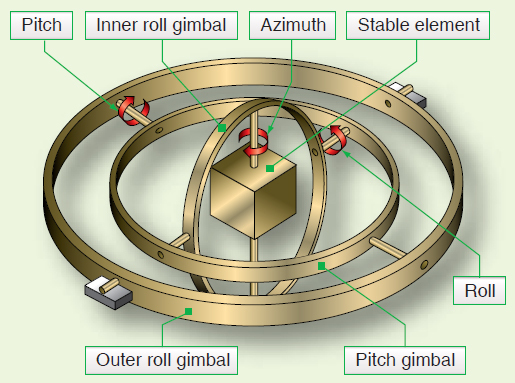 The original gimbaled gyroscope has been replaced by newer designs. These gimbal-less gyros consist of a ball that is suspended in a magnetic field and spun electronically. Evacuating the air in the gyro cavity further reduces friction. The result is a near frictionless gyro with precession rates measured in years. Optical sensors measure the ball’s orientation from symbols etched on the surface of the ball. Accuracy and dependability of first generation systems have greatly improved with the introduction of the ring laser gyro (RLG) INS. The RLG INS replaces the three pendulous mass accelerometers with three RLG accelerometers. Technically, the RLG is not a gyroscope since it has no moving parts, but it gives the same information as a gyro. A RLG is made from a single block of glass with three holes drilled through the glass to form a triangular path. Two of the openings are plugged with mirrors and the triangular tube is filled with helium neon or other lazing gas. When the gas is charged, the lazing gas produces two counter-rotating laser beams that are reflected around the path by the mirrors. Both laser beams emerge through the third hole in the glass and are superimposed upon each other to produce an interference pattern. As the RLG moves, one beam has a longer path to travel; the other a shorter path. This causes changes in the interference pattern that are detected by photocells. The angular rate and direction of motion are computed as accelerations. Another recent development is the inertial sensor based on vibrating quartz crystal technology. Like the RLG, these are not true gyros. Acoustic gyros are manufactured from a single piece of microminiature quartz rate sensor. Angular accelerations affect the patterns produced by a vibrating tuning fork and result in torque on the fork proportional to the angular acceleration. These gyros appeared in inertial units in the late 1990s. Autopilots and attitude indicators use gyrostabilized platforms. Inertial navigation simply requires a stable platform with higher specifications of accuracy. A gyrostabilized platform on which accelerometers are mounted is called a stable element. It is isolated from the aircraft’s angular motions by three concentric gimbals. The stable element is the mounting for the linear accelerometers, gyroscopes, and other supporting equipment. The supporting equipment includes torque motors, servo motors, pickoffs, amplifiers, and wiring. The effectiveness of the stable platform is determined by all parts of the platform, not just the accelerometers and gyros. The linear accelerometers measure acceleration in all directions and the gyros control the orientation of the platform. The platform must contain at least two gyros with two degrees of freedom. A simple diagram of a two-degreesof- freedom gyro mounted on a single-axis platform is shown in Figure 16-2. If one-degree-of-freedom rate gyros are used, three units are needed, each gyro having its own independent feedback and control loop. The original gimbaled gyro was not very accurate by today’s standards, producing sizeable amounts of gyroscopic precession. Recent developments such as the air-bearing gyro and the electronically suspended gyro have only 1/10,000,000 the friction of a standard gyro and negligible real precession. Today’s gyros have real precession rates of less than 360° in 30 years. The four-gimbal mounting provides a full 360° freedom of rotation about the stable element, thus allowing it to remain level with respect to local gravity and to remain oriented to true north. This is north as established by the gyros and accelerometers, regardless of the inflight attitude of the aircraft. The azimuth, pitch, and outer roll gimbals have a 360° freedom of rotation about their own individual axis. The fourth, or inner roll, gimbal has stops limiting its rotation about its axis. This gimbal is provided to prevent gimbal lock, which is a condition that causes the stable element to tumble. Gimbal lock can occur during flight maneuvers, such as a loop, when two of the gimbal axes become aligned parallel to each other, causing the stable element to lose one of its degrees of freedom.